When there were hardly any options when it comes to partitioning, people used partitions that looked more like pin-cushions. Each teams in offices had their space, where they would work. But, using such abrupt partition was eventually creating problems and was not contributing in making the office space look that personal. Now, the concept of partitioning has changed a lot, with the advent of the glass partition walls. There are plenty of advantages of using the glass partition walls. All you just need to realize the benefits of glass partition walls and you will surely fall for this option to make your office the ultimate space. What are the core advantages of using glass partition walls? The first and foremost reason why most other offices use glass walls is to make sure that even a small office space looks spacious and bigger. As compared to conventional versions of glass partitions, everyone can see each other and the space will look much more amazing. Glass is one such material that can make even the small spaces look bigger and that is one of the crucial reasons why glass partitions are used in bathrooms. 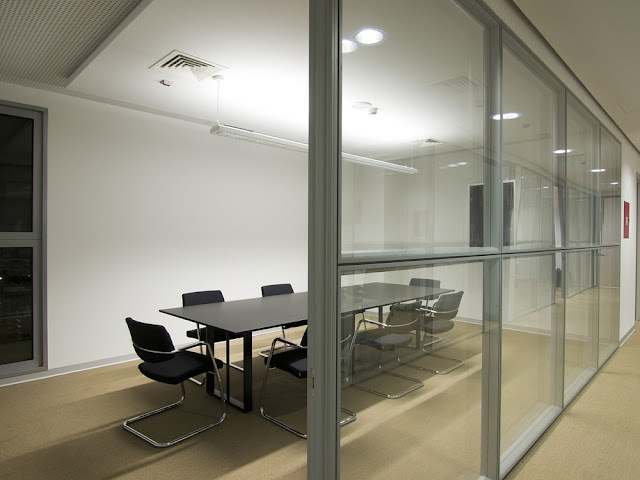 When glass partitions will be used, you can be absolutely sure that your office space gets ample light. Natural light can help your staffs keep headache at bay. No matter how much lighting you put in, there is hardly any comparison with the natural light. The abundance of the natural light can also make your office space lively, instead of boring and dull. A boring work environment can never improve productivity. If you wish to increase the productivity of your office space, you need to make sure that your office space gets the necessary makeover. Apart from that you can install some minor lighting system in your office and home because glass partition can reflect the maximum natural lights during day and it can save your electric consumptions also. While the conventional partitions can separate the team members completely, glass partitions give them their much needed privacy without cutting them off completely. Isolating teams with conventional partition affects the team spirit as well. The major advantage why most people prefer using glass partitions is its capability of reducing noise. When the glass partitions are used in offices, the double glazed glasses are used, meaning there will be two panes of glasses, filled with a gas which helps in reducing noise eventually. With such amazing ways, there is hardly any requirement to get the meetings held in a closed room; you can organize a glass surround boardroom for meetings and other necessary discussion for the betterment of your company. Having one such boardroom in office not only has a professional finish but also gives an elegant look. With the increasing demands of the glass partitions walls, you will definitely get many options that are affordable and ensures longevity. You can hire the professionals to ensure proper results. Just put in your search over the internet and you will find plenty of companies that offer such services. You can discuss the matter in details with the professionals and set your budget. While talking about the budget, make sure that you ask the professionals about the time it will take to furnish your office space completely.